Here you will find the Best of the Best High Quality Replica Arms and Armour From Medieval and Renaissance Europe! 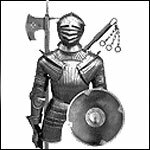 Suitable for Live Steel - SCA - LARP - Re-enactments - Fantasy Events. Fully Functional Combat Ready Single Pieces of Armor. Includes Helms, Pauldrons, Gorgets, Arm Armor, Leg Armor and Body Armour. Fully Functional Combat Ready Full Suits or (Harnesses) of Armour. Can be used for Stage Performance, Jousting or Foot Combat Re-enactments and SCA Fighting. Fully Functional Combat Helms in Standard and Custom Sizes. Many with different finishes and options. Can be used for Stage Performance, Jousting or Foot Combat Re-enactments and SCA Fighting! Fully Functional Combat Ready Shields. Can be used for Stage Performance, Jousting or Foot Combat Re-enactments and SCA Fighting. Combat Ready and Historically Functional Morning Stars and Maces. Fully Functional Combat Ready Battle Axes. Your Choice of Sharp or Blunted Versions. Combat Ready and Historically Functional Flails. Fully Functional and Battle Ready Medieval Spears, Lances and other Pole-Weapons. Combat Ready and Historically Functional War Hammers.